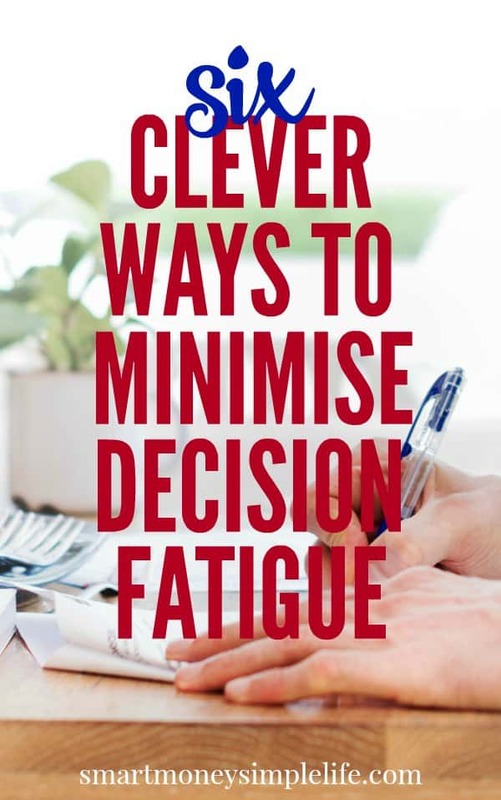 Do you need to minimise decision fatigue? Lately, it feels like there’s just a bit too much going on. As a result, I’ve been looking for ways to minimise decision fatigue and free up some brain space for the really important stuff. I’m already one of those people who wears the same thing, or very nearly, every day so that’s one area which doesn’t cause decision fatigue. Naturally, I wondered if I could successfully apply that same theory to other areas of my life. Here are a few of the steps I’ve taken in my daily life to minimize decision fatigue. We’re all creatures of habit. The trick is to make those habits work for us. That’s where a daily routine comes into its own. This is especially true if you work from home. Every morning, I make a pot of coffee then head to the computer. I usually check email from overnight, take a quick look at the news sites and then head out for a walk. This routine used to work when I had very little on my plate but now that I’m studying full-time, running two blogs and an Etsy shop, I don’t have time for distractions. Now, I kick start the day by grabbing a coffee and jumping straight into work. If you’ve got a busy household or an over-stuffed schedule start some daily routines. Time management experts recommend starting with a morning and an evening routine, and build from there. Another aspect of working with routines is to set a start time and a finish time for your workday. I flirted with this idea for a long time but have only just put it into practice. As a result, I seem to be working less and yet, I’m getting more done. Having a set finish time, especially, is like having a daily deadline. And, that’s a good thing. Tasks have a habit of taking up all the available time and if you don’t have a set time to finish your daily tasks, you’ll still be working when bedtime rolls around. That’s true whether you work from home, you’re a stay at home parent or your work for ‘the man’. Creating some hard edges in your day enables you to enjoy downtime for yourself and your family, avoid burnout, and another way to minimise decision fatigue. I’ve been very slack with menu planning lately so every evening it’s the same quandary; what to have for dinner. I already eat the same breakfast every day so I’m considering applying that approach to both lunch and dinner. Apparently, many successful people regularly eat the same thing to free up mental space so I’m definitely going to experiment with this idea. I’m not sure the theory of ‘eat the same thing’ will be embraced by the other member of my household, so for dinners, I’m creating a very simple menu plan. vegetarian on Monday, Italian on Tuesday, Asian style on Wednesday. You get the idea. Keep the food simple and stick to family favourites and, if all goes well, dinner will become a decision-free (and angst-free) zone. Habits allow us to operate on auto-pilot. That can be a good thing or a bad thing depending on the habit. However, you can use your existing habits to help create new ones. A great example is keeping hydrated. I don’t have to think about drink coffee, it’s just what I do in the morning, but I do need to consciously decide to drink water. Now I combine pouring a cup of coffee with pouring a glass a water. I drink the water there and then in the kitchen and take the coffee with me. Limit your options and you’ll also limit analysis paralysis. Aldi knew what they were doing when then chose their approach to their product offering. Aldi don’t offer 15 different options in baked beans or canned tomatoes. At best, you’ll be offered organic and non-organic and in the case of tomatoes, pureed or whole. How do you streamline decision making in your daily life? I’d love to hear your obvious and not-so-obvious tips and tricks? Start a blog. Blogging is a great way create additional income. I make semi-passive income each and every month from my blogs and you can, too. Use my guide to create your own blog and you can start your blog for as low as $3.95 per month. Plus, sign up through my link and you get a free domain. Pinterest. Pinterest is my favourite way to promote my blog and boost traffic. You can make pinning even easier if you use BoardBooster to schedule your pins. Use this link to sign-up for their free trial. If you want a simple graphics program to create your pinnable images, I highly recommend PicMonkey. It’s easy to use – even for novice designers. You can find more recommended resources here: Blogging Resources.